1377 Laurel St•San Carlos, CA 94070•(650) 591-9711•M-F 11-3 p.m., 4-8:30 p.m. & Sat. 12-3 p.m., 4-8:30 p.m•Contact•Call in for a take-out order! 100% no lard and lean meats—Heart Bueno! La Hacienda Mexican restaurant has been serving authentic mexican cuisine in San Carlos since 1980 in a warm, family-friendly atmosphere. Come in any day Monday through Saturday for lunch or dinner. We serve award winning Mexican food with absolutely no lard and the leanest meats. Heart bueno! We have comfortable outdoor seating so you can enjoy your meal even more on those beautiful San Carlos days and a party room if you would like to celebrate an occasion in a larger group. 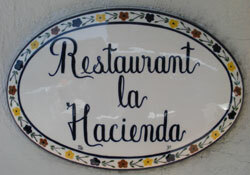 La Hacienda has been serving San Carlos since 1980. Owners, the Ramirez family, bring Mexican cuisine from the Jalisco region in a family-friendly atmosphere. Over 30 Years of Flavor! La Hacienda has been owned by the Ramirez family for over 30 years. Our cuisine is influenced by the central region in Mexico known as Jalisco. We serve a full lunch menu every day Monday – Saturday. Bring your co-workers, your family, or come by yourself. La Hacienda is the perfect setting for your lunch plans.